General Hospital (GH) spoilers for Monday, May 14, tease that Michael (Chad Duell) and Dante (Dominic Zamprogna) will enjoy some brotherly bonding. They’ll meet up for a chat about their lives and the drama within their family. When talk turns to Nelle (Chloe Lanier), Michael will admit they’ve managed to find common ground. He’ll feel confident that they can be good parents to their baby. Of course, there may not even be a baby anymore thanks to Nelle’s tumble. She was struggling over the blanket with Carly (Laura Wright) and ended up falling down the stairs. Carly cried out in horror, so it won’t be long until all the guests rush in. They’ll see Nelle bleeding on the floor and naturally start to panic. Olivia (Lisa LoCicero) will wonder what’s going to happen if Nelle dies. She’ll crouch over Nelle’s unconscious body as she reels. Meanwhile, Monica (Patty McCormack) will examine Nelle as best as she can. Someone will undoubtedly call for an ambulance, but Monica will want to take things a step further. She’ll get in Carly’s face and snarl that she’s calling the police! Once Nelle awakens and can give her statement, she’ll indeed accuse Carly of pushing her. Dante will have to make an arrest soon, so this GH storyline is really heating up! In the meantime, Sonny (Maurice Benard) and Jason (Steve Burton) will try to make sense of their discovery. They found Scully’s money clip in the Croton field, but the gun and body have already been moved. Sonny may worry about who has the evidence and how this person might use it against him. Over with Jordan (Vinessa Antoine), she’ll have some reservations about tying the knot. General Hospital spoilers say Jordan just won’t think she’s ready for marriage. Fortunately, someone will give her a pep talk. Jordan will surely get used to the idea of this major commitment. At Aurora, Peter (Wes Ramsey) will tell Valentin (James Patrick Stuart) there’s been a new development. Will he fill Valentin in on the emails from his mother? Anna sent them anonymously and warned Peter that Valentin couldn’t be trusted. However, Peter has no reason to trust the mom who gave him up either. He’d rather rely on his ally, so Valentin will probably get the scoop. Across town, Alexis (Nancy Lee Grahn) will have a crucial conversation. She’ll be perplexed when Anna doesn’t seem to know something important. Alexis will ask if “he” even told Anna about this, so this discussion may involve another secret of Valentin’s. Anna will likely battle suspicions about what else Valentin’s hiding. 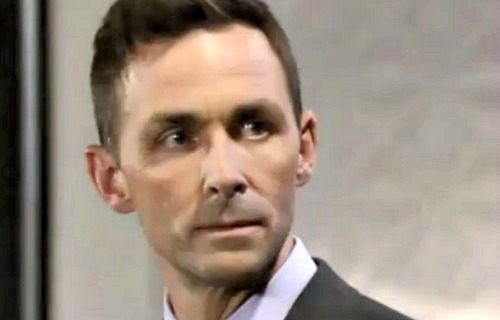 General Hospital spoilers say some fantastic scenes are on the way. We’ll give you updates as other GH news comes in. Stay tuned to the ABC soap and don’t forget to check CDL often for the latest General Hospital spoilers, updates and news. General Hospital Spoilers: Mal Young Brings Genie Francis Back to The Young and the Restless – Y&R Capitalizes on GH’s Loss?